Our research teams are always tirelessly scouring the earth for new and wondrous decorations to show off every Halloween season. Sometimes, we find some things that seemed awesome at first, but then upon closer study, don't work out (Note: we're not saying we found spooky decorative slime that looked really cool at first, but then just attracted tons of bugs and melted the paint off the wall, but if we had, that would be a great example of one that didn't work out). Luckily, we find actual-cool stuff much more often! One of the more exciting specimens we've recently come across is this striped Orange & Black Glitter Pumpkin. 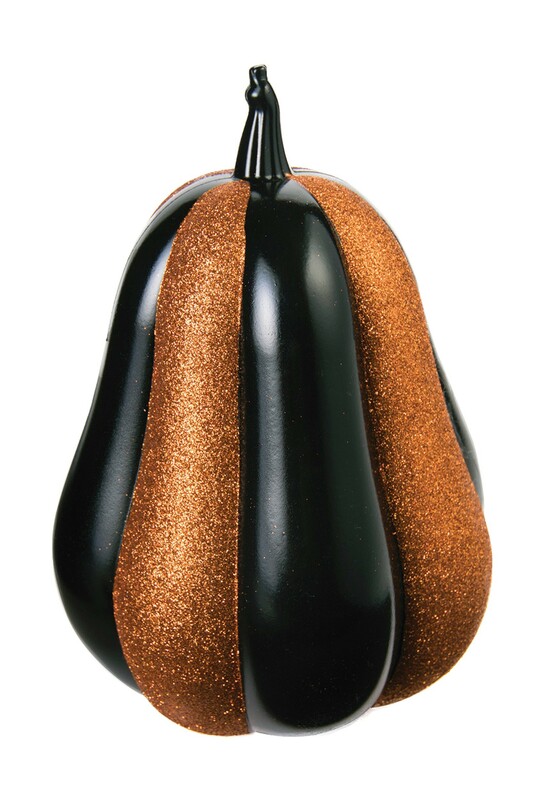 At first glance, this gourd seems like more of a curious oddity than a decoration. But upon closer inspection, the rich, glossy black and the sparkling orange segments come together to look very Halloweeny. It will make a classy accent to your decoration arrangements, and a great conversation starter during your festivities!